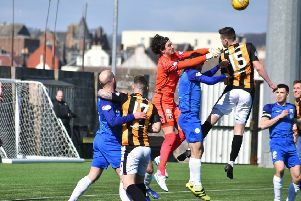 Gary Naysmith left East Fife for Queen of the South. Jim Stevenson admitted it was with a heavy heart that he saw Gary Naysmith depart Bayview. Naysmith, who guided the club to last season’s League Two title, left the Fifers for Queen of the South on Thursday afternoon. It was agreed between the two clubs that the deal would not be concluded until after Monday night’s scheduled Scottish Cup tie with Edinburgh City. That match was called off on Monday and rescheduled for Wednesday, meaning Naysmith is now no longer at the helm. Dougie Anderson, East Fife assistant, who will join up with Naysmith at Queen of the South, is expected to take charge of Wednesday’s Scottish Cup tie and also Saturday’s trip to Brechin, according to Mr Stevenson. The manager’s move came out of the blue, with the Fife chairman confirming the switch was wrapped up within barely 24 hours. He said: “It happened really quickly.